We had a bit of a moan a couple of weeks ago with regards to Matt Prior being included in Wisden's prestigious 'Five Cricketers of the Year' for 2009. We questioned whether Prior's performances in last year's Ashes, which were the basis of his selection, merited his inclusion and asked whether those that had attained a high level of performance in the County Championship such as Michael di Venuto, were maybe more justified recipients of the accolade. So it is only fair that we redress the balance a bit after Prior's brilliant knock yesterday for Sussex in their Division 2 match with Middlesex at Hove. On a day when 13 wickets fell for 263 runs, Prior scored an undefeated 123 to steer top of the table Sussex to a total of 217. By all accounts the pitch was grassy and with the next highest score of the day being Murray Goodwin's 17, then Prior must have batted with consummate skill to score nearly half of the runs made in the day. His innings only took 149 balls and it was his high strike rate during the Ashes series last year, which can be the only justification for his inclusion as one of the Five Cricketers of the Year. The Reverse Sweep likes Prior; he does play for our county after all, and it is to his credit that he has improved his woeful wicketkeeping to such an extent that he is worth a place in the England test side for his work with the gloves alone. He faces a serious challenge for his spot from Craig Kieswetter, but if he can produce innings in the face of adversity like the one yesterday then he should be safe in the test side at least for the foreseeable future. Matt Prior - A Wisden Cricketer of the Year? 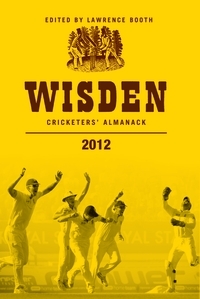 As a bit of a cricket traditionalist who prefers whites to pyjamas, tests to T20 and Brian Johnston to Danny Morrison, I always look forward to the annual publication of the Wisden Cricketers' Almanack. Indeed, despite my wife's protestations that they take up too much room on the bookshelves, the purchase of said tomb is an annual event to be celebrated alongside the anniversaries of Agincourt and Waterloo (well, I am an Englishman living in France!). I see that this year's Wisden celebrates England's Ashes triumph last summer and editor Scyld Berry launches a scathing attack on the counties putting self-preservation above the fortunes of the England cricket team. So far, so good; or so I thought. Then, we get on to the five cricketers of the year. Now I know that this honour is only bestowed on a player once, with the notable exceptions of Pelham Warner (1904 and 1921) and Jack Hobbs (1909 and 1926), is based on cricketers' impact on the English season only, and that consequently this limits the choice to some extent. But I was surprised to say the least that Matt Prior was one of the lucky recipients. Of the others Stuart Broad bowled the decisive spell of the series, Graeme Swann was vital to the wins at Lord's and the Oval, Michael Clarke was consistently brilliant with the bat and Graham Onions made a decent start in England colours to follow on from excellent performances for Durham. But Prior? Yes, his keeping improved markedly last summer culminating with the stumping of Marcus North at the Oval. But given that prior to last summer he couldn't have kept worse if he had been blindfolded and had his hands tied behind his back, that is not saying much. With the bat, Prior scored 261 runs against Australia at 32.62; even with a strike rate of over 80 that is hardly earth shattering stuff. So, is Prior the most fortunate ever recipient of what is a very prestigious award? And who could have been honoured instead? The answer to the first question is probably yes and as for other more worthy winners? How about Jonathan Trott who had a first-class average of over 80 and then despite doomsayers and amidst intense pressure scored a hundred on test debut at the Oval. Or how about Ben Hilfenhaus who consistently impressed for the Aussies throughout the series and was probably the best bowler on either side. And no doubt there were many more worthy winners in the county game such as Michael Di Venuto to name but one.